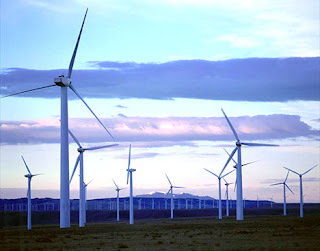 I have written frequently on the benefits of renewable energy, specifically wind power. It is easy to build, emission free, and uses less than 5% of the land on which turbines are sited. As a result, wind power is the fastest-growing energy source in the world. It has taken my industry by storm – we see more and more clients who want their products made in plants powered with wind power (using offsets), as it helps send a values-laden message to an organization’s constituents that they are trying to be good stewards of the environment. All of these developments will lead to greater wind power generation capacity which will help the US reduce its dependence on oil, the majority of which comes from foreign sources. It may take a number of years, but the promise is great – as demonstrated in Spain. During one week this spring, wind power accounted for just over 40% of the country’s overall energy demand. And although this number may be a bit high, due to lower-than-normal energy demand, this figure is very exciting and gives us a big goal to shoot for.